Stems usually several or many from a deep, slender, perennial root, smooth and simple, 4 to 15 inches high. 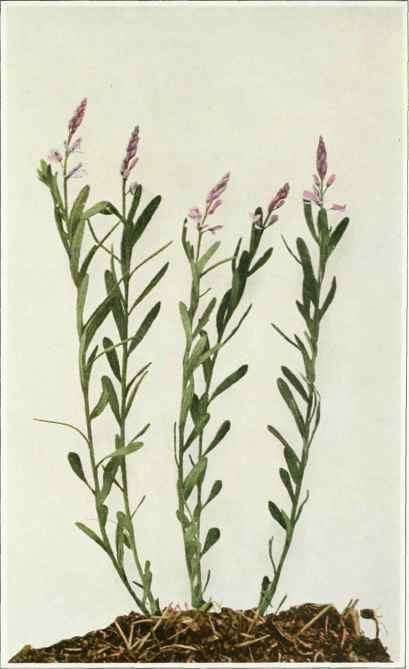 Leaves crowded along the stems, oblong or broadly lanceolate, blunt, mucronulate, two-thirds to 1 inch long and about one-sixth of an inch wide or less, the lower leaves usually smaller. Flowers purple, rarely whitish, in a loose, terminal raceme, 1 to 3 inches long or less; wings of the flower broadly ovate; crest of the corolla large and fringed; stamens eight. Numerous cleistogamous flowers are developed upon conspicuous, whitish subterranean branches which rise from the base of the stems. In dry or sandy fields and meadows, Nova Scotia to Manitoba, south to Florida, Texas and Michigan. Flowering in June and July.